Author’s Note: For the next two Tuesdays we will continue our look at our relationship with Jesus. As a reference we will study how two men responded to Jesus’ crucifixion and resurrection. We will walk with them as they return from Jerusalem to their home in a small town seven miles away. 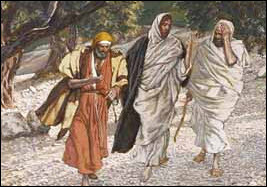 On the Road to Emmaus Jesus encounters them and changes their lives. Somewhere along the road you will see yourself. You can evaluate where you are in your own walk with Jesus. You can decide whether you like where you are and whether you want to change how you respond to Jesus’ crucifixion and resurrection.